Bonjour ! If you are subscribed to the Talk in French newsletter, you probably know that I answer a lot of questions sent to me by subscribers. The questions range from language, travel, culture, and basically anything related to France that the readers can think of. Here, I’m sharing with you some of the questions sent to me. This way, it would benefit more audiences aside from the newsletter subscribers. I want to get your guidance on how I can improve in using the correct tense. Sometimes I remember when to use subjunctive, and I often forget the “imparfait et plus-que-parfait.” I know these things come down to practice … but I need to master this. Do you have any tips? Your tip reading more in French really resonated with me! How to use the right tense is always a challenge not only for French language learners like you, but even for native French speakers as well. Many French people get confused between the future and the conditional tenses, for example. So if you get confused between certain tenses or mood, try not to worry too much. But, here are a few tips that might help you. 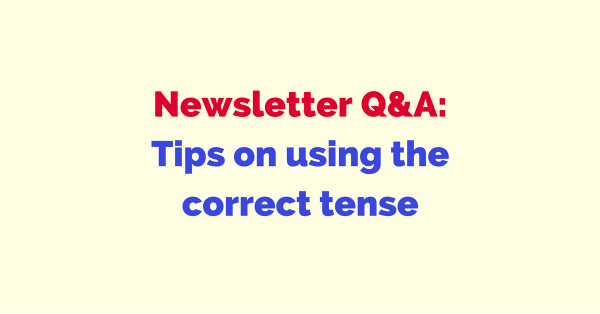 The approach between using some tenses or mood in oral versus written form should be differentiated. Let me explain. You mentioned « plus que parfait »; we do not use it too much in oral communication so I don’t recommend that you spend so much time on it unless you plan to use it in the written form. In that case, then you should pay more attention to it so that you can use it when you write, let’s say, an essay. Imparfait : describe past habit. E.g. when I was young, I used to go to school at 6 am= imparfait. « j’allais à l’école à 6 heures » . Or express an opinion about something you did « it was good » = c’était bon. Of course here I over simplify the explanation, please go to my website to see more details about the tense. Check the lessons here and here. Please bear in mind that I over simplified my explanations here. But here the idea is to uncomplicate the grammar and focus on the main scenarios, not on the exceptions. Now for writing, you should take your time to really absorb the rules and try to challenge yourself in using more difficult tenses and mood. If you have someone who can correct your writing, that’s even better. In general, tenses need some serious work and drills. But over time, you should be able to familiarize yourself with it. Do you have questions about French language and culture? Send it over to me using the contact form below and I’ll try to reply to your questions in my weekly newsletter.